Long before Audi, there was DKW and Auto Union. 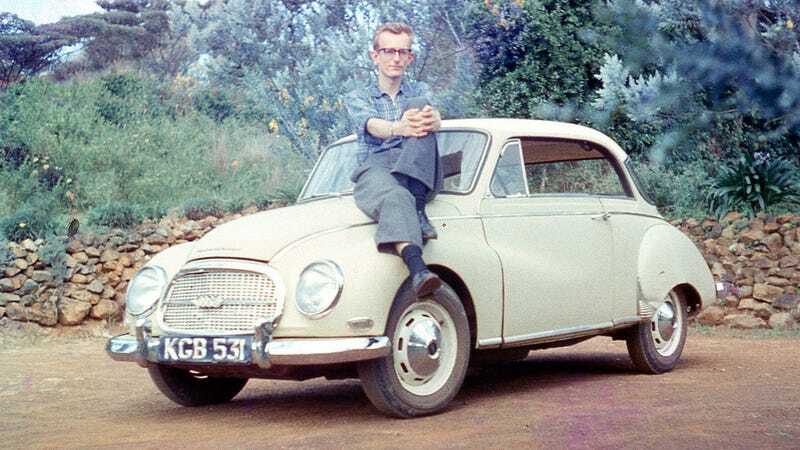 If you thought Saab two-strokes were the business, check out what a three-cylinder two-stroke of German origin could do surrounded by the wilderness of Africa. He came home with other slides though, and these images tell a story. The DKW was much loved in those parts of Africa both for its reliability (very simple engine with few moving parts) and redundancy (a separate coil for each cylinder so if one failed you could still go with the remaining two) ruggedness (low voltage distributor unaffected by moisture allows one to ford rivers) and front-wheel drive (rare in those day - but good for pulling through soft sand or mud). The saloon model I had was the 1000S but I also used a jeep-like model called the "Munga" originaly built for the German army. It was frequently used in amateur racing - being a 2-stroke with no valves it was a high-revving engine which coupled with front-wheel-drive (good for cornering) made it very compettitive in races, hill-climbs, and rallies. The most famous of the East African drivers (and frequent winners) were two brothers - amateurs - who first stunned the crowds one year by winning in a second-hand Volvo PV-544 - which they bought after it had been entered as a new car the previous year. This year they opted to join us in the under 1 litre class with a Volkswagen Beetle. It had the advantage of being light (body sheet-metal was thinner than that on the Auto-Union DKW and it had an air-cooled engine) but suffered from being rear-wheel drive - not good in mud or soft sand. A popular national sport in East Africa was rallying. This started in 1952 when the first "Coronation Safari" was held to celebrate the accession of Elizabeth ll to the throne. Held over a 4-day Easter weekend, it involved driving Narobi-Mombasa (return) for one leg, then Nairobi-Kampala (Uganda) for another leg, and finally Nairobi to Dar-es-Salaam (Tanganyika) and return for the last leg. It was not supposed to be a race of the fastest, but a Rally invoving accurate driving to a schedule. But because nobody could keep up with the schedule, it became a race for the fastest - and most reliable - and best at slogging through mud and/or soft sand and able to withstand encounters with wild animals, boulders in the road etc. The cars were divided into classes,and battling it out in the smallest class in the mid 1960's were the Swedish SAAB's at under 1 litre capacity versus the Auto Union DKW's of similar capacity. We had a team of locally entered DKW's - almost a perfect car for the safari rallye. A 3-cylinder two-stroke engine meant hi-revs, no valves to burn out, and lubrication that survived a rock through the sump plate. Front-wheel drive meant it could pull itself through mud and sand. Low-voltage distributor to a separate coil for each cylinder meant that it didn't care if the ignition got wet or a coil burned out. This was a team-mate re-entering Narobi after a day and a night of high-speed driving across the Rift Valley to Kericho and back - for 6 hours mandatory rest before setting out for Tanganyika on the next leg. For official business, they just used a Land Rover, as you do. That's me on the left, the other guy is the local veterinarian (and doctor in case of emergency), he is holding the map. I can tell from the surroundings and the adjacent slides that we were on our way to higher altitudes in the Aberdare mountains. It was a month or so after this when my companion in this picture was forced to remove my appendix using anesthetics designed for bovine use, as were the staples with which he closed up the wound after. He did a good job but it hurt like hell for weeks afterward. Stopped at a cross-roads, probably because cross-roads were unusual enough to take note of and do a map check. Here the sign says that Oloitokitok is 56 miles ahead, Kajiado is 72 miles to the right, Sultan Hamud is 14 miles behind us, and the nearest habitation is Emali Station which is 8 miles to the left. The guy in snake boots was the local veterinarian (and closest thing we had to a doctor in the district) and the other guy was Public Health Officer. On the right is apparently a villager who has been down to the river with her two kids to fetch water (in the drum on her back). If she had had an infant at the time, it would have been in a sling on her front. I can't be sure, but likely we stopped her so that the PHO (Public Health Officer) could check the water she had collected for parasites or bacteria - particularly Schistosomiasis (commonly known as Bilharzia). The Aberdare mountains were a restricted/controlled area - mainly to keep track of who had entered so they coud be rescued or retrieved in case they didn't exit as per filed plan. Also it had been a notorious hideout for terrorists in the 1950's so the authorities liked to keep an eye on comings and goings into the high jungle. Eventually the road peters out and you can see no higher ground around you, a good place to stop for the night on what appears to be the top of the world. It''s not nearly as high as Mt Kenya or Kilimanjaro, but still mighty cold at night for all its proximity to the equator. Yes, I'm aware that the last two weren't lions. Still, imagine what an elephant could have done with the DKW. But luckily, animals seemed to like the thing. ...or Lake Bunyoni. The land in the middle Bwama Island, where a certain Dr Sharp set up a leper colony in the 1920's. On the road, potholes weren't the main obstructions in Africa. The droppings of the African Elephant can be quite large, as tall as maybe halfway up the wheel, and half as wide as the car. A skilled tracker can tell by TT (Turd Temperature) how far away the elephant might be. If the pile is still steaming in the early morning coolth, be careful in case you are tempted stop on the road to do your own business behind a tree. Bridges need maintenance, while concrete causeways are pretty indestructible. Besides which water can flow over the top when iti is abundant, but otherwise is held in a pool behind the dam thus providing a watering hole for wildlife for a much greater part of the year. My Auto-Union DKW 1000S Sonderklasse carried me reliably for many miles over good roads, bad roads, and sometimes non-existent roads. Image credit and many thanks to Jitze Couperus!